HEALTHIER, INDOOR AIR MADE EASY! ADVANCED HIGH EFFICIENCY CARBON FIBER STRING FILTER! 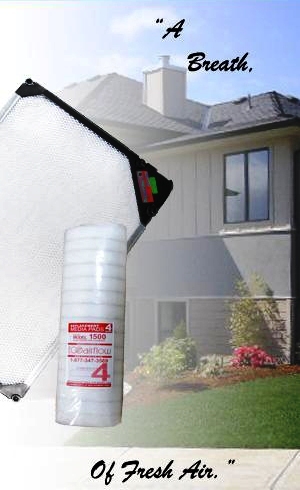 ULTRA-EFFICIENT U.S.A. MADE WEAVE BONDED FIBERGLASS FILTER MEDIA! Formerly called the AIRSCREEN 1500, AIRCLEEN 1500 and ALLERGYMATETM this unit replaces the Model 1300 One Inch Electronic Air Cleaner with metal frame. SPRING FEVER SPECIAL! Year round by popular demand! Complete Model 1500 home air filter system with a Model 6000 air filter booster and a one year supply of filter media free. SPECIAL PRICE $349.95! The ECOairflow 1500 Electronic Air Cleaner is the first central air cleaning device in the world to utilizes the excellent carbon string filter technology for a lower pressure drop. This unique carbon fiber has been perfected by the research and development team at ECOairflow. The carbon string electrodes dramatically improves filtration performance while protecting equipment energy efficiencies due to its low static pressure. The ECOairflow 1500 uses the carbon string filter technology to capture and remove harmful airborne contaminants. This new innovation combines electronic polarization and ionization to safely and efficiently purify your indoor air. It is the first time these two electronic processes have been used in combination to create high filtration efficiencies. 95%! Also a greater amount of airborne particulates are captured by the U.S.A. made 16.5 gram weave bonded fiberglass filter media. The result is a remarkably safe, non-ozone producing, maintenance friendly air cleaner. The ECOairflow 1500 continuously increases in efficiency to remove harmful lung damaging particles from your indoor air! When it is installed in your central heating & cooling system, the EcoAirflow 1500 and its carbon string filter media will provide you with worry free, air purifying performance twenty four hours a day .... even while you sleep! *FEATURES NEW HIGH EFFICIENCY CARBON STRING FILTER MEDIA AND A SHORT CIRCUIT PROTECTED POWER-HEAD! Add an ECOairflow Model 6000 Filter Enhancer Probe a device that is designed to increase the filtering efficiency of any furnace filter, to include the excellent ECOairflow Model 1500 series electronic furnace filters.